What time then should I be online then to get into the 9x9 match? As you can see from the schedule, there is a “registration” and “start time” section under each tournament. 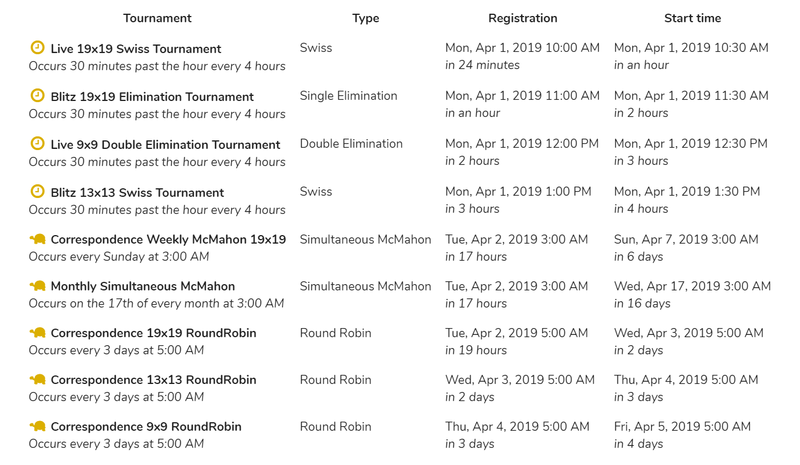 In the correspondence tournaments, you have at least a day between the “registration” and “start time” of the tournament (depending on the tournament). Therefore, you don’t have to be there moments before the tournament starts (and hopefully this allows you to find a more convenient time to sign up, instead of getting up at 5:00 a.m.). I am not 100% sure what is going on with the trophy symbol, but I think that this usually applies to the “real time” tournaments. There is an easier way to register for the tournament. Sometime between the “registration” and “start time” of the tournament, you can go under the correspondence section of the tournament page and scroll down until you find the desired tournament (again, only after the “registration” begins). Finally, since it is a correspondence tournament, you don’t have to be there when it actually starts. You can sign up before and if it starts while you are asleep or at work, then that is okay, you don’t have to be on OGS. Simply make your first moves when you are available on the server (and before your time runs out a few days after the tournament starts, you can see the clock info on the tournament page for details). You may have already known a great deal of this, but I hope it helps. Don’t hesitate to ask if you have further questions or if I did not answer your question.